Our current AngularJS project has been under development for about 2.5 years, so the number of unit tests has increased enormously. We tend to have a coverage percentage near 100%, which led to 4000+ unit tests. These include service specs and view specs. You may know that AngularJS – when abused a bit – is not suited for super large applications, but since we tamed the beast and have an application with more than 16,000 lines of high performing AngularJS code, we want to keep in charge about the total development process without any performance losses. We are using Karma Runner with Jasmine, which is fine for a small number of specs and for debugging, but running the full test suite takes up to 3 minutes on a 2.8Ghz MacBook Pro. 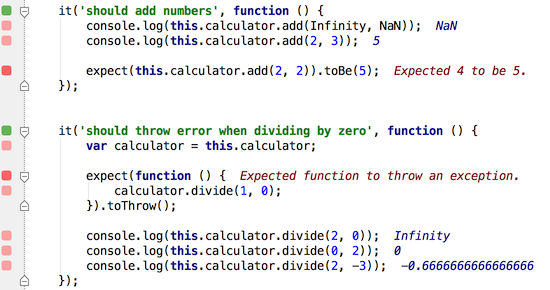 We are testing our code continuously, so we came up with a solution to split al the unit tests into several shards. This parallel execution of the unit tests decreased the execution time a lot. We will later write about the details of this Karma parallelization on this blog. Sharding helped us a lot when we want to run the full unit test suite, i.e. when using it in the pre push hook, but during development you want quick feedback cycles about coverage and failing specs (red-green testing). With such a long unit test cycle, even when running in parallel, many of our developers are fdescribe-ing the specs on which they are working, so that the feedback is instant. However, this is quite labor intensive and sometimes an fdescribe is pushed accidentally. And then…. we discovered WallabyJS. It is just an ordinary test runner like Karma. Even the configuration file is almost a copy of our karma.conf.js. The difference is in the details. Out of the box it runs the unit test suite in 50 secs, thanks to the extensive use of Web Workers. Then the fun starts. 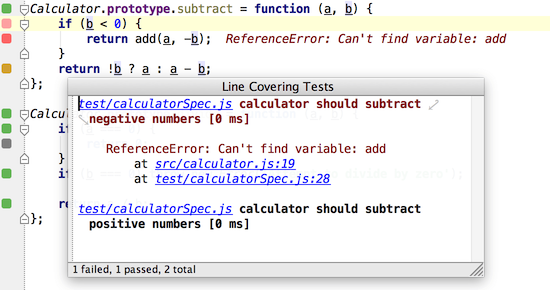 I use Wallaby as IntelliJ IDEA plugin, which adds colored annotations to the left margin of my code. Green squares indicate covered lines/statements, orange give me partly covered code and grey means “please write a test for this functionality or I introduce hard to find bugs”. Colorblind people see just kale green squares on every line, since the default colors are not chosen very well, but these colors are adjustable via the Preferences menu. Clicking on a square pops up a box with a list of tests that induces the coverage. When the test failed, it also tells me why. Since the implementation and the tests are now instrumented, finding bugs and increasing your coverage goes a lot faster. Beside that, you don’t need to hassle with fdescribes and fits to run individual tests during development. Thanks to the instrumentation Wallaby is running your tests continuously and re-runs only the relevant tests for the parts that you are working on. Real time. Follow progress on Atom integration development here: https://github.com/wallabyjs/public/issues/24. You said, “We will later write about the details of this Karma parallelization on this blog. Sharding helped us a lot when we want to run the full unit test suite, i.e. when using it in the pre push hook …”. I could not find an article for this. Do you have one yet? I would love to hear how you solved this issue. Unfortunately this article has never been written. The sharding script we were using did help us a lot, because Wallaby (still) doesn’t have CI support: https://github.com/wallabyjs/public/issues/72. Nowadays I would suggest to use Jest because it has built in parallelization.